Green lacewings are delicate and beneficial insects. Their bodies are usually bright green to greenish-brown, and the compound eyes are conspicuously golden in many species. 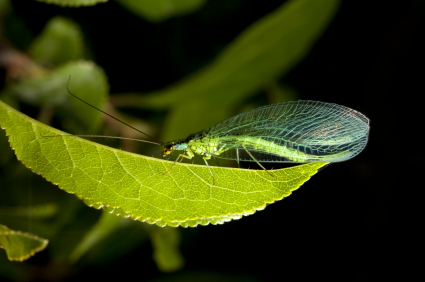 The wings of the Green lacewings are often translucent, with a slight iridescence. Some may have green wing veins, or a cloudy brownish wing pattern. Green lacewing larvae are sometimes referred to as â€œaphid lionsâ€ or “aphid wolves”; and with good reason. This natural exterminator will attack and consume large numbers of aphids, mites, lace bugs, and other small insects. The adult Green lacewings are crepuscular or nocturnal. They feed on pollen, nectar and honeydew; supplemented with mites, aphids and other small arthropods. Depending on the species and environment, some green lacewings will consume approximately 150 pest prey in their entire life, and in other instances 100 aphids will be eaten in a single week. Green lacewings offer a safe, though sometimes costly, non-chemical alternative for naturally controlling common pests; like aphids and lace bugs. Gardeners can attract lacewings, and ensure a steady supply of larvae, by introducing companion plants; and tolerating some beneficial weeds. 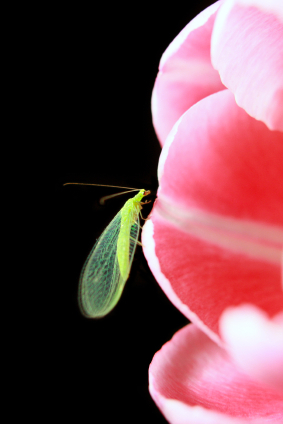 The Green lacewing are attracted mainly by sunflowers, dandelions and dill. Pollen, nectar or honeydew are also necessary, to sustain the generally nonpredaceous adults.